Constitutional change in Hungary: what can the EU do? An earlier version of the below article appeared in the UK Constitutional Law blog on 17 January. On 18 January of this year, in the face of EU pressure, Hungarian Prime Minister Viktor Orbán agreed to review some of the fundamental changes his government has wrought on Hungary’s constitutional framework. But what powers have the EU in the face of democratically implemented constitutional change? The answer is: quite a lot. The EC considers legislation allowing Cabinet ministers to participate in Central Bank meetings, requiring the meetings’ agendas to be sent to government representatives in advance and obliging members of the Central Bank to sign an oath of loyalty, violates Articles 127(4) and 130 of the Treaty on the Functioning of the EU. It points to the compulsory retirement age of judges as an infringement of Council Directive 2000/78/EC, which prevents discrimination in the workplace. This is interesting, because other EU member states require their judges to retire by a certain age. For example, Lord Sumption, the newest member of the UK Supreme Court, will be required to retire upon his 70th birthday. Compulsory judicial retirement is also commonplace outside the EU: for example, it has applied to every appointee to a federal court in Australia since 1977. The EC’s real issue is likely to be that the new Constitution’s lowering of the retirement age will force around 300 judges to retire in the coming year. The new President of the newly-created National Justice Office, Tunde Hando, is a family friend of Prime Minister Orbán and the wife of an influential Fidesz politician. Ms Hando has the power to appoint new judges and it is not unreasonable to expect that these appointments will have a distinctly partisan flavour. It would be naïve, however, to believe that the EU will be able to stem entirely the tide of constitutional change that Orbán’s government has set in motion. Media reports of Orbán’s decision to ‘cave in’ to EU pressure or ‘back down’ on constitutional change are misleading: Orbán has agreed to revise only these three issues; and even then only because his government is struggling to pay off national debt in the face of a steadily falling forint and is looking to cut a deal with the IMF. Civil rights activists worry that Orbán will make cosmetic changes to the Constitution to satisfy the EU and continue with the rest of his “very exciting process of renewal”. The EU has notably not challenged Fidesz’ draconian new media laws, or its radical reshaping of Hungary’s electoral system. Prominent Members of the European Parliament say that the legal proceedings do not go far enough. The concern is that Hungary will be able to capitalise on the heavy workload of the EU and slip out of this challenge to its new Constitution without having to compromise too much. On 1 January 2012, a new Constitution (or Fundamental Law) took effect in the Central European state of Hungary. From even before that date, there has been considerable international comment to the effect that the governing Fidesz party, led by Prime Minister Viktor Orbán, has misused its parliamentary majority to pass laws which have laid the path for authoritarianism. In response, the Hungarian government has claimed that it has done no more than to update an outdated document. The new Constitution is the first that Hungary has had since the Communist-era Constitution of 1949, an amended version of which was in effect until 31 December 2011. Hungary is the only ex-Soviet country that did not enact a new written Constitution with the fall of Communism in 1989-90. Such an enactment has been a policy platform for various political parties in Hungary since then, and Fidesz made it a major part of its election promise in its 2010 campaign. Tibor Navracsics, the Deputy Prime Minister of Hungary, has argued that the new Constitution “introduces some much-needed simplification. For instance, the number of ombudsmen will be reduced to one from four.” More than this, he argues that it “draws a line under the last 20 years and locks in the values of the political transition of 1989-90.” In any event, the changes have all been effected within the law due to Fidesz’s two-thirds ‘supermajority’ in Parliament. These two opposed positions form the basis for a fascinating case study in the question of where law obtains its legitimacy. The United States has expressed concern about the nature of Hungary’s Constitutional reforms but admits that the Fidesz party’s “Prime Minister Orbán and his government were elected through a free and fair election with an overwhelming majority”. The usual rhetoric of Western governments in such circumstances is that they have obtained a ‘mandate’ to govern, which is to say the right to have their chosen legislation enacted by Parliament. Furthermore, the Hungarian Ambassador to the USA has expressly denied claims that these changes were sprung on an unsuspecting public, noting that there had been “long-standing consensus among the major political parties in Hungary that the current Constitution was in need of an overhaul.” This point is illustrated by the fact that “the last Hungarian government to have a two-thirds majority, the Socialist-Liberal coalition of the mid-nineties, actually wanted to change the Constitution, but the two coalition partners were unable to agree between themselves how to go about the changes”. The nature of the ‘concern’ that is being expressed by the USA, the European Parliament and the Venice Commission for Democracy through Law of the Council of Europe, amongst others, is therefore that there are some constitutional values whose effect is greater than that of validly enacted legislation. The answer, of course, is that the “culture, social structure and political organisation” of countries vary and, therefore, so too will their respective constitutional systems. Dr Navracsics has recently emphasised the point that “there is no one standard democratic model” but has said that regardless of this, the new Constitution “enshrines a classic separation of powers between Hungary’s legislature, executive and judiciary … [and] … upholds parliamentary democracy and the rule of law”. The opponents of the Fidesz government would doubtless deny the last of Dr Navracsics’ claims. The rule of law is notoriously difficult to define and, like beauty, usually resides in the eye of the beholder. The debate, for practical purposes, boils down to the question of whether there are things that a legislature can do which lose their legal validity on the basis of being outside of non-legislative norms. Jeffrey Goldsworthy has declared the demise of common law constitutionalism in his book Parliamentary Sovereignty (2010, CUP) and it is true that this movement has many fewer vocal adherents than it once did. He has conceded, however, that there are now many more people who look to (constitutionally entrenched) fundamental rights as being preferable to the superiority of Parliament. In the absence of entrenched rights, what kinds of things might a legislature do – validly in a positivist sense – which could be said to violate non-legislative (Constitutional) norms? The opponents of the new Hungarian Constitution have pointed in particular to two major issues: judicial independence and fair electoral laws. It would not be an overstatement to say that Hungary’s new Constitution seriously compromises the independence of the judiciary. The Constitutional Court, so carefully set up in the wake of the collapse of Communism, has gained international recognition for the impressive body of case law it has generated in the past 22 years. However the Court, which gave the judiciary the role of reviewing almost all proposed legislation on the basis of its constitutionality, has been rendered “functionally dead.” The jurisdiction of what the Court can review has been limited to non-economic legislation, unless it has a severe impact on fundamental rights; new positions have been created on the bench, promptly filled by Fidesz’s political allies; and the court can no longer rule on the constitutionality of legislation in the abstract. The rest of the judiciary is also in disarray; the new Constitution’s lowering of the retirement age will force around 300 judges to retire in the coming year. The President of the newly-created National Justice Office, Tunde Hando is a Fidesz partisan with the power to appoint new judges, (which she will be doing a lot of, there being such a sudden dearth of them following the new Constitution’s reduction of the compulsory retirement age), move judges to different courts, and soon will be able to decide, with the public prosecutor, which judge will decide which case. A spokesman for Prime Minister Orbán has argued that the independence of the judiciary is not at risk because Ms Hando cannot dictate the outcome of a case. This argument is simplistic: a fundamental ingredient of the independence of the judiciary is its immunity from being selected, moved around and placed on certain cases. The judiciary must be completely separate from the Executive. The appointment of a close personal friend of the Executive to the role of President of the judiciary sails dangerously close to the wind. Key members of the Association of Hungarian Judges recently issued a letter condemning “political attacks” by the Socialist Party leader and insisting that their independence remained intact. But this letter was crucially sent after the passage of the law placing Tunde Hando in her current hiring-and-firing position. The issue of electoral laws is another area to which critics have directed their attentions. Constitutional amendments leading up to this new Constitution have radically redrawn electorates to Fidesz’ advantage. A Hungarian think-tank has established that, based on these new electoral boundaries, Fidesz is the only party that could have won the last three elections. These same amendments have also changed the way in which elections are administered: a new election now means a new electoral commission. In the lead-up to the most recent election (of 2010), Fidesz was able to throw out the existing members and replace them with five members of its own party. These are just a sample of the kinds of radical changes to the legal and political landscape that this new Constitution has, and will bring about in Hungary. The new document, along with the ten constitutional amendments that have been implemented in the last twelve months, impose “more overtly political management” of almost every independent public institution. The four offices of the ombudsmen, which dealt with completely separate issues and had far-reaching jurisdictions, have been downgraded to one weaker role. New media laws enacted in the lead-up to the new Constitution have seen the creation of a media board staffed by Fidesz officials whose job is to review media and impose fines for violation of regulations relating to political ‘balance.’ The terms of public officials put in place by the party, like the head of the national budget council and the state audit office, have been increased to terms of six to twelve years. They can only be replaced by a two-thirds vote in Parliament. The question remains then: do these measures violate constitutional norms, although they are validly and democratically implemented? Hungary has a unique political history in many ways that renders its political reality different to the majority of Western democracies and even other ex-Soviet states. The country has seen its fair share of near-totalitarian governance; some Hungarian commentators believe that Orbán is trying to revive the autocratic, near-fascist government of 1920s Miklós Horthy. But while the rule of law is a subjective concept dependant on the relevant political model, we would argue that there are some key ingredients that, if compromised, undermine the rule of law to the point of non-existence. The independence of the judiciary is one. The ability for the judiciary to police the Executive adequately and the legislature to protect the rights of individuals and to curb arbitrary use of power is a fundamental tenet of the rule of law. In the Hungarian case, this independence has unquestionably been compromised by the severe restriction of the ambit of judicial review and the infiltration of party politics into positions of power over the judiciary. Fair electoral laws are another basic constitutional norm necessary for a democracy that adheres to the rule of law. Manipulating electorates to ensure a continued supermajority in Parliament is a step too far. Just one example of how the new Constitution so flagrantly violates constitutional norms as to risk the integrity of democracy itself in Hungary. The Venice Commission has expressed grave concern about the following phrase in the Constitution’s Preamble: “We do not recognise the communist constitution of 1949, since it was the basis for tyrannical rule; therefore we proclaim it to be invalid.” Instead of declaring the previous Constitution to have been repealed, this specific wording suggests the acceptance of ex tunc nullity; which could “lead to the result that all acts of state enacted under the former Constitution would lose their legal basis and will thus be invalid themselves.” In its report, the Venice Commission points out that such an interpretation could mean case law decided under the now “invalid” Constitution would also be declared a nullity; even Constitutional institutions like Parliament could be declared “legally inexistent.” The deliberately vague wording means that such an outcome, while very unlikely, is possible. Such a possibility bodes very ill for the future of the rule of law in Hungary. * Second-year student in the Juris Doctor programme, University of New South Wales. ** Lecturer and Member of the Gilbert + Tobin Centre of Public Law, Faculty of Law, University of New South Wales. This entry was posted in Discussion and Debate, News and tagged Greg Weeks, Sophie Duxson by eutopialaw. Bookmark the permalink. I do not mean to nit-pick, but some of your factual assertions are not correct. 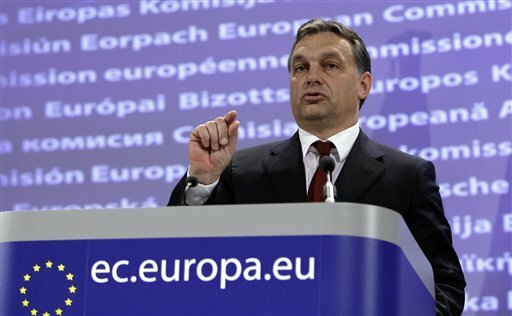 In the second paragraph of your post you say that the European Commission has commenced legal proceedings against Fidesz, Hungary’s ruling party. The Commission cannot start legal action against a political entity – the infringement procedure has been started against Hungary, not its ruling party. Secondly, you say that these proceedings have been commenced under Art. 7(3) TEU. This is wrong. The Letters of Formal Notice, sent to Hungary on January 17th, start the “regular” infringement procedure laid down in Art. 258 Treaty on the Functioning of the European Union (TFEU). Art. 258 TFEU allows the Commission to bring an action against a EU Member State before the European Court of Justice if it is of the opinion that the Member State has violated EU Law and did not adhere to the Commission’s recommendations. Art. 7(3) TEU is a different thing altogether. It empowers the Council to suspend certain rights (including voting rights) of a Member State if the Council determined that there exists a serious and persistent breach by said Member State of the values laid down in Art. 2 TEU. This procedure has been introduced after the quarrel with Austria over Jörg Haider’s participation in government, but has – so far – never been used and is not suited to deal with “normal” breaches of EU law, which is what the Commission is accusing Hungary of. So now you realize how ineffectual statements of “concern” really are. 1) if there is a direct violation of the constitution, correction is the legal course of action. 2) if there is a direct violation of the conditions of membership, all the EU can do is boot them out by whatever process there is to do that. 3) The other choice, one which would crearte a precedent, is legally no different that rolling into Prague with T-38s, which is to force a change outside of the laws of Hungary or the EU. 4) Be equally callous to the concept of self-determination and arm and insurgent movement. Thank you very much for your response. We note that the BBC article of 17 January, which we provide a link to in the second paragraph, indeed says that the EU commenced proceedings against the state of Hungary. We are grateful for your insights into the relevant articles of EU law; much appreciated. We look forward to any further comments from persons interested in these legal proceedings by the European Commission. For further information, interested parties should look at the European Commission’s press release: http://europa.eu/rapid/pressReleasesAction.do?reference=IP/12/24&language=EN. The idea that Hungary had still its 1949 Constitution before the enactment of the Fidesz Basic Law is wrong and feeds into that party’s propaganda. The 1989-1990 Constitution was in fact newer with respect to its predecessor than the current Basic Law. It was materially an entirely new constitution. Only the amendment rule was left over from 1949, and indeed it is still left in by Fidesz. The correct depiction of the 1989-1990 law is “interim Constitution”. Like South africa’ it was a new document signifying full regime change, and indeed it too was produced by the amending process as the interim constituion of 1994. This unthinking and stupidly formalistic notion should not be repeated. As Cohn-Bendit said at the EP discussion last week, it was very surprising, or would have been, had Hungary been let into the EU with a Stalinist constitution. For English authors to make this mistake is even more serious. By such criteria the UK still has its 1689 Constitution. The claim about 1949 is just as absurd. I apologize or using the terms stupid and formalistic. I was referring to the claim made in Hungary. Of course it is not the responsibility of English lawyers to know every aspect of this sorry story.